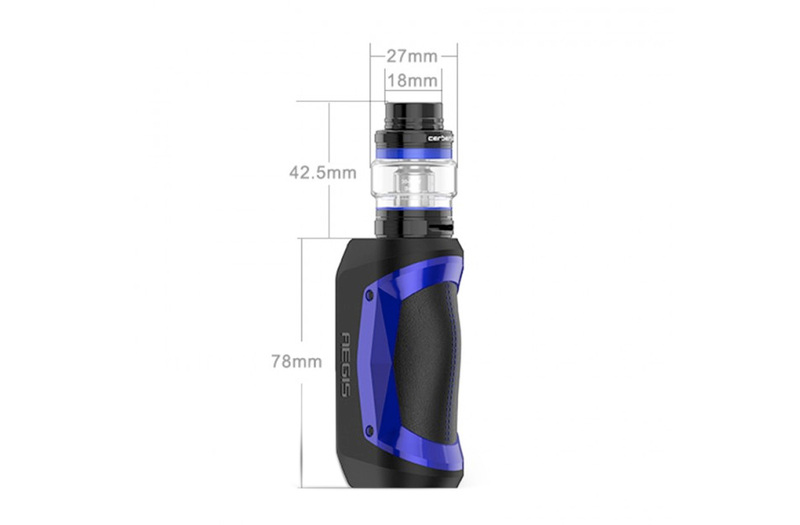 The kit Aegis Mini Geekvape consists of a Mod Aegis Mini 80W water resistant, shockproof, dust tight, and incorporating a battery of 2200mAh. 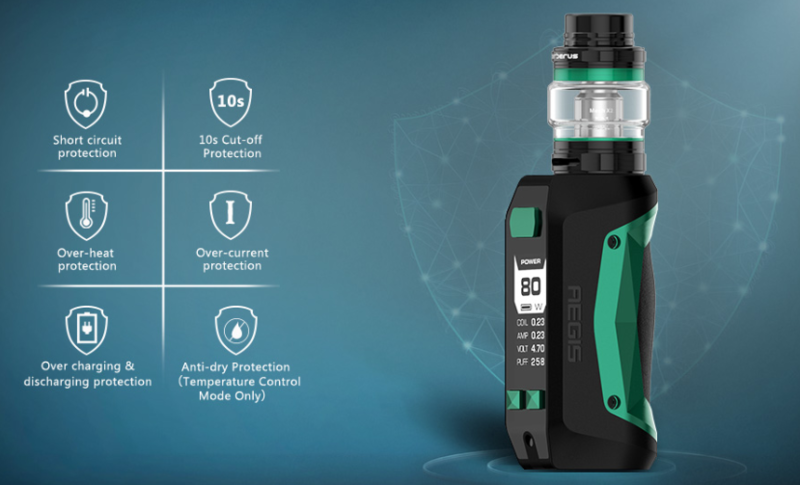 The Mod Aegis integrates the one of the chips to the more advanced with a power displayed real, an instant trigger of 0.09 seconds and 6 protections. The kit Aegis Mini Geekvape consists of a Mod Aegis Mini 80W and an atomizer Cerbrus 4ml and 5.5 ml. The Kit is water resistant, shockproof, dust tight, and especially ultra-compact and lightweight. The Mod uses up to six different materials of high quality to get the style and durability extreme. Etench IP67, able to withstand immersion up to 30 minutes and up to a depth of 1 meter. Shock-resistant, the Mod is less likely to break by accident ! Anti-dust (IP67), the Mod is able to withstand an environment that is dirty or dusty and can be cleaned easily. The chipset advanced ACE brings a time of high-speed response with stability and precision. 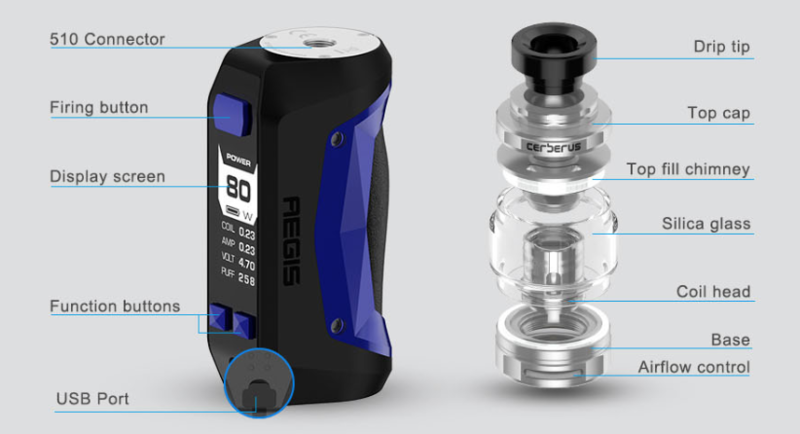 The Aegis Mini adopts several protections such as short circuit, overheating, overload, the on-impedance, the automatic switch-off after 10sec, etc..
To fill the reservoir of the Cerberus, it is sufficient to rotate the upper part of the atomizer a quarter turn to reveal the filling ports. The adjustment of the air flow is through the bottom by turning the ring. Resistors replacement for the clearomiseurs Shield and Aero Geek Vape. Available in 3 versions : model IM1 0,4 ohm, model IM4 is 0.15 ohm and the version Mesh X1 0,2 ohm. Sold in pack of 5 units.